The “vanilla” of the tarantula hobby. 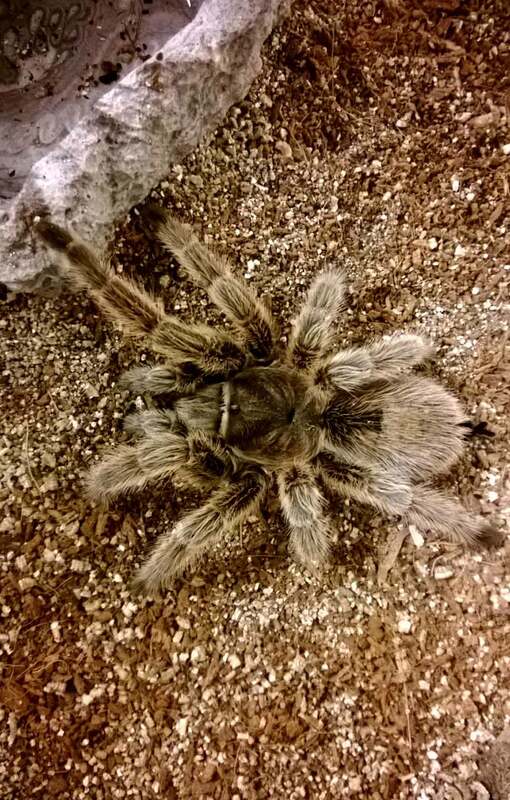 Anyone who has read my bio or some of my posts knows that the first tarantula I ever acquired was my female Grammastola porteri (Common name, “Chilean Rose” or “Rosie”). Back in 1996, my future wife and I had just moved into our first apartment together, and I was was assembling a menagerie of pets I wasn’t allowed to have when I lived at home. After purchasing several snakes and a ferret, I decided it was time to fulfill a life-long dream and finally get a tarantula. Unfortunately, it was illegal for pet stores to sell tarantulas, so I took to the local classifieds to find a T. Little did I know that I was about to buy what would eventually become my longest-living pet. My G. porteri (Chilean Rose) about a year ago. 18 years later, and “The Queen”, as we affectionately refer to her, is still going strong. 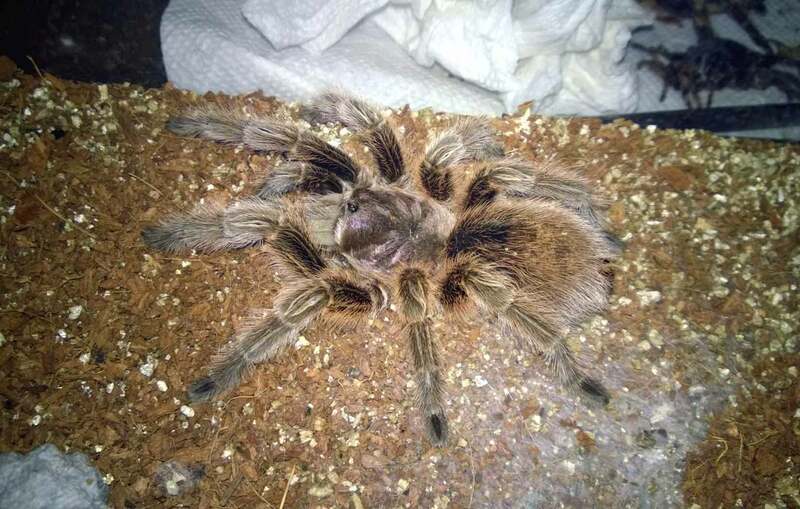 When I acquired her, she was close to adult size at about 4.5″ or so, and she has molted four times while in my care. As Grammastolas are notoriously slow growers, and my female was a wild-caught specimen, we estimate that she was anywhere from 5 to 10 years old when I acquired her, meaning she is now in her 20s. Her last molt was back in 2008, and she is now a full 6″ DLS (diagonal leg span). Experts on this species estimate that, with the correct care, females could be expected to live 30+ years. Two color forms…or two species? For years, G. porteri and G. rosea have been staples in the tarantula hobby due to their ease of care, availability, and reputation for being particularly docile. Although this is still subject of debate, the tarantula referred to as the “Chilean Rose” is actually listed as two different species by The World Spider Catalog. For years, they have been labeled as different color forms of the same species, with G. porteri usually being referred to as NCF (normal color form) and G. rosea being called RCF (red color form). The G. porteri, the species I keep, is more of gray brown coloration with a pinkish/maroon sheen on its carapace, and the rosea is known for it more red/pink tones. However, color may not be the best way to tell these species apart, and suspected cross-breeding has likely rendered differentiation an even more muddled affair. Care for this species is very simple, and they prove to be quite hardy in captivity. I keep mine in a 5-gallon acrylic enclosure on bone dry coco fiber substrate. I supply a cork bark hide and a water bowl; this is one of the few Ts that I keep I have actually witnessed drinking. My G. porteri is a wonderful hunter, and has a great food response. I feed her 3-5 large crickets a month, easing off a bit during the winter months. Although this doesn’t sound like much, she has a plump abdomen and is in wonderful shape. There are no special temperature requirements, as this species will do well at room temperature. Basic rule of thumb; if you’re comfortable, then your G. porteri will be fine. Temps in my tarantula room are high 60s to mid 70s in the winter, and mid 70s to low 80s in the summer. This is a species from an arid environment, so there is no need to mist or moisten the substrate. A water bowl will provide all of the moisture it will need. Sorry, but I’m just not hungry this year. “Rosies” are notorious for fasting. Doing a quick search on the arachnoboards forum will yield dozens of threads about G. roseas and G. porteris NOT eating for long periods of time. This is normal behavior and nothing to be concerned about. I’m very fortunate in that my G. porteri has never fasted. I do, however, have a G. rosea sling, who stopped eating for most of the winter, a period of about four months. Some report their G. porteris/roseas have fasted for over a year. These two species have a reputation for being very docile and handle-able, and they are therefore recommended as “beginner Ts” to those entering the hobby. Although I agree that they are great beginner tarantulas due to their ease of husbandry, this species’ temperament can be VERY unpredictable. Stories of “Psycho Rosies” can be found on any tarantula message board, and more than one keeper has been bit trying to hold his “docile” pet rock. As with any species, temperment varies from animal to animal, and care should always be exercised when performing cage maintenance or rehousings. Although my G. porteri appears very laid back, she has a great feeding response and will charge at any disturbance in her enclosure. Pet rock? Maybe. Beautiful T? Yes. However, most owners of these species enjoy that their T is always visible, making it great for display, and appreciate its more easy-going temperament. Also, although I find that mine will spend long periods just sitting, it’s an event when she does get the urge to moving around and explore. Despite only being gray/brown in basic coloration, she is still a handsome tarantula and more than just a giant brown spider. Leg striping and a gorgeous pink/maroon sheen on her carapace add a touch of beauty to this species. Although I’ve gotten into much faster and aggressive old world tarantulas, and I enjoy some of the large and feisty South American species, I will always love the G. porteri/rosea species. The ease of care, availability, and generally docile temperaments make it a wonderful beginner tarantula as long as the new owner is patient with long fasts. Even for experienced keepers, the “Chilean Rose” makes a wonderful addition to the collection. For an amazingly comprehensive article and care sheet for this species from an expert in tarantula care, Stan Schwartz, CLICK HERE. ← C. cyaneopubescens and P. cancerides Molts – Pictures! I hade a rose for several years. she was given to meas an adult and was going on twenty. She died a few years ago. I really enjoyed her and would love to find another one. I read your reviews on vendors and i think i will have to wind up ordering online (petsmart has taken over the world). Its looking like my cheapest option will be to get a sling. I am a little nervous because i have only ever cared for and adult T. Can you give me a little advice on what to expect, particularly feeding wise. Petsmart hasn’t only taken over the world, but they still don’t know jack about tarantula husbandry! 🙂 I’m so glad that people are finally discovering that you can buy tarantulas online through reputable dealers. Rose hair slings are cute and hardy as heck, but they grow SOOOOO slowly as slings. I have one that I got almost 2 1/2 years ago as a 3/8″ sling. She’s only about .65″ now and has molted three times in my care. Most of them will fast at some point, and it can be very frustrating, especially if it’s your only T. Also, just know that if you start with a small sling, it could be several years before it actually starts to look like a hair tarantula. Because mine was so tiny at first, I fed her mostly dead prey, like small baby crickets and piece of meal worms. They will scavenge feed at that size, so giving the prekilled is easier than trying to find prey items tiny enough. Again, they are amazing spiders, and they live forever (I’ve had mine for 20 years, and we estimate that she was probably 7-10 when I got her), which is fantastic. The slow growth rate and fast can be a turnoff to some though. Just something to think about. Have you looked for juveniles? They’re usually not much more, and they grow a bit faster at that size.